People who enjoy interior decorating can do so in an environmentally friendly manner. Even the most seemingly innocent household products can be manufactured according to unsustainable industrial practices or have chemicals that create indoor air problems. However, customers can avoid these issues by decorating their homes using green products and ideas. Almost any room can incorporate some green furnishings, decorations, and other décor, including the bedroom, living room, and bathroom. If you're concerned about certifications from third parties, check each product before purchasing. Otherwise, take a look at the product's material list and decide if it uses enough green, organic, recycled, or otherwise environmentally friendly materials or sustainable manufacturing processes to meet your personal standards. The first thing anyone will notice about a bed in terms of interior design is its bedspread and its pillows. 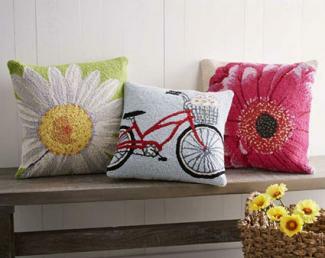 New pillows and a new bedspread can brighten a room and completely change its look. There are plenty of organic duvet covers available through places like West Elm (WE). People can replace their current duvet covers with genuinely stylish, clean versions from WE, updating their rooms and improving their health in the process. Adding a lot of pillows onto any bed can instantly make it appear to be more fashionable and inviting. Places like The Clean Bedroom offer a wide range of pillows that lack toxic chemicals, allowing people to pile the pillows onto their beds without increasing levels of indoor air pollution. People typically have comparatively few pieces of furniture in their bedrooms, but the bed itself already provides plenty of opportunities for green interior design. A larger investment would be to swap out the current mattress for a newer, greener one, if you're in the market to buy new. Consider the GREENGUARD® certified ones offered by Lifekind. Your sofa and flooring are two of the biggest pieces in the living room, so consider going green for these items. Adding a new sofa can instantly change the look of an entire room for the better since a drab sofa can make an entire room look dull right along with it. The living room sofa is often the focal point of the area, and sofas are often riddled with flame retardant chemicals, as indicated by EcoSelect Furniture (EF). People who are redecorating their living rooms could help themselves and help the environment by ordering stylish new furniture through places like EF, which specialize in non-toxic furniture. Getting new rugs can brighten a living room and make it look that much more polished and new overall. There are many ways to make carpeting more environmentally friendly. The carpet manufacturers could reduce their usage of chemicals, make their carpets with recycled materials, or try to make their own manufacturing processes more sustainable. Volatile Organic Compound emissions are kept to a minimum. 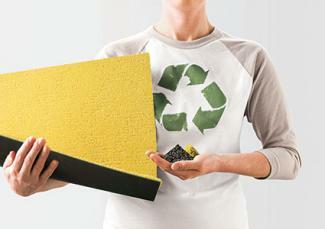 Customers are encouraged to return used FLOR squares instead of discarding them, at which point FLOR will recycle them. The FLOR squares themselves incorporate recyclable or renewable materials. People can easily use these carpeting squares to create stylish and innovative carpeting patterns. Instead of replacing or disposing of old furniture, people could reupholster that furniture using recycled materials, making the furniture and the rooms around them both newer and greener. Making one's own furniture through recycled materials is a fun project that can create new furnishings for one's home in the process. Scissors and Spatulas offers a great example of turning an old headboard into a bench. Many people are familiar with the various ways of making a bathroom greener, like using water saving devices. However, many people are interested in redecorating their bathrooms at different points, since the bathroom is one of the focal points of most homes. They can decorate their bathrooms using green bathroom furnishings. Work from the bottom up to pick out floor covers that are environmentally friendly. Pottery Barn has some stylish organic bath rugs people can use instead of the non-organic varieties. People often specifically try to present their bath towels in a decorative manner or use decorative bath towels, which can function as accents for bathrooms. They can make their bathrooms greener by purchasing organic bath towels from places like Earthsake. Updating one's wall color can instantly spruce up an entire room or even the whole home or apartment. ECOS Paints products do not contain Volatile Organic Compounds. 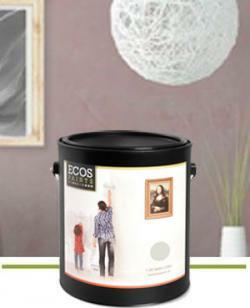 The ECOS Paints cans can be recycled and were manufactured out of recycled components. They maintain energy-efficient manufacturing operations. Mike Matthews at Home Guides offers some tips for consumers that are trying to learn how to identify environmentally friendly paint products, noting that even the smell of environmentally unfriendly paint can be a dead giveaway. People often clean their paint brushes in a way that's environmentally damaging. They may also remove the initial coats of paint using remarkably toxic chemicals. There are various types of paint removers on the market today that are safer to use and biodegradable, such as the versions from Citristrip. As Design For Good (DFG) indicates, a number of people needlessly discard their paint brushes when they're finished, which squanders resources, and washing paint brushes in the sink will ultimately negatively influence water ecology and sewage treatment. DFG has suggested a new method of storing and sterilizing paint brushes that involves a sieve and a filter bag, thus preventing the individuals in question from introducing the chemicals of the paint into the water supply. 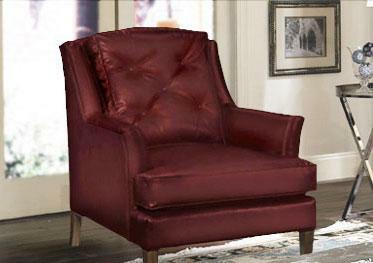 Adding accents to a room can instantly give it an individualistic touch. They fill out empty space and can make seemingly minimalist rooms seem more complete. Accents can add touches of color to otherwise monochromatic settings, and they can add new textures to rooms that are otherwise characterized by lines and angles. People use accents all over their homes, including their living rooms, their bathrooms, their bedrooms, their kitchens, and their dining rooms. They have many opportunities to replace these accents with more environmentally friendly versions. The website Green Your Decor is a good resource for people that are trying to keep their options open as much as possible when it comes to choosing green products online. Some green accents are distinguished by being artisanal products. As such, fewer natural resources were involved in their creation. Other green accents and decorations were made using recycled materials or natural components. Artisanal products are also more ethical in terms of labor rights than many mass-marketed products. VivaTerra is an excellent resource for people that are interested in purchasing green decorations, accents, and other green household products. VivaTerra places a great deal of emphasis on style as well as sustainability. Many of their products are artisanal, and many are made with recycled glass or reclaimed wood. The simplest way to do green interior decorating simply involves replacing the items one would have used anyway with more environmentally friendly alternatives. Some people may choose to adopt a more minimalist approach to their interior decorating since using fewer products automatically means using fewer resources. However, using greener products will usually suffice. Making some green decorations is simple. People can pick some flowers, press them until they're dry, and then put them into artisanal or handmade picture frames. Setting natural decorations like this around a home helps signify the owner's commitment to green interior design in more ways than one. People can demonstrate their commitment to sustainability in multiple ways, and green home décor is one of them. Sustainability is a major trend throughout a number of different industries, including home improvement. People who embrace sustainability in their interior decorating decisions are being modern and stylish in more ways than one.